Juristech™ has introduced the Microsoft Windows 10 version of Citepad™, the first and only virtual keypad designed for lawyers, law students, and paralegals. The Mac OS X version was released earlier this year. 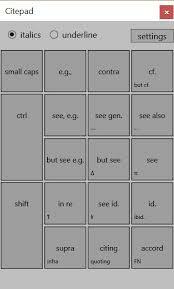 Citepad is an on-screen keypad which floats over word processing programs and allows 1-click, pre-formatted insertion of commonly-used legal words, phrases, and symbols such as “id.,” “see, e.g.,” and the section symbol. Citepad automatically formats legal citation signals and eliminates up to 19 keystrokes that legal professionals type multiple times per day. It also gives users the added confidence that their signals will be uniform and conform with citation formatting rules. Citepad modernizes legal writing which traditionally relies heavily on the keyboard to execute complex formatting rules. The Mac OS X and Microsoft Windows 10 versions of Citepad are available at www.juristechproducts.com. For a limited time, Citepad will be sold for a one-time price of $14.99. The release of Citepad corresponds with a time of increasing pressure on attorneys and legal professionals to adopt technology. This pressure comes from two sources. First, law firms have faced intense pressure since the 2008 financial crises to do more with less. Although firms are anticipating moderate growth in 2017, the market has permanently changed and clients consistently insist on efficiency and cost-cutting measures. Second, the American Bar Association’s 2012 amendments to the Model Rules of Professional Conduct clarified that lawyers have a duty to be competent not only in law practice but also in technology. To date, 27 states have adopted the duty of technological competence, according to legal technology blogger Robert Ambrogi. Citepad offers a new and different way for attorneys to be efficient. Attorneys who already format their own pleadings can do so more efficiently. Paralegals and legal secretaries who use Citepad will gain time to complete more substantive work, and will be able to produce error-free citations with ease. Juristech LLC is a Nevada company dedicated to creating efficiency products for attorneys by attorneys. Citepad was Juristech’s first product. Juristech was founded in 2017 by cofounders Emily Montgomery and Preston Pope. Preston Pope is an engineer who recently led the tech teams for multiple startups in Silicon Beach. Emily Montgomery graduated from UCLA Law and was a prosecutor and a litigator before becoming the Chief of Staff for Sackett National Holdings, Inc.